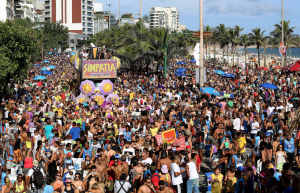 RIO DE JANEIRO, BRAZIL – In the last weekend before the official Carnival dates for 2016, the city of Rio de Janeiro will see well over 150 blocos (street parties), and on Saturday alone there are 71 officially scheduled. Some of the biggest and best started with Céu Na Terra this morning at 8AM in Santa Teresa, and Bloco Simpatia É Quase Amor? which starts at 4PM in Ipanema. The Bloco Simpatia É Quase Amor in Ipanema during Carnival 2015, photo by Fernando Maia/Riotur. This year the authorities announced that there will be 505 blocos, almost fifty more than last year, and then there are the many spontaneous and small neighborhood blocos that were not officially licensed. The blocos grow in size and energy with each passing day in the lead up to the official dates (February 5-9th this year), and traditionally Monobloco closes the season, the weekend after which this year is on February 14th. For those with the passion, stamina and Carnival know-how, it is possible to plan your day around the city, hitting 3 or 4 blocos, and then continue on for the night. For example, tonight one could start in Santa Teresa, pass through Zona Sul (South Zone), and then end up in Lapa for the Eu Amo A Lapa which runs from 9PM to 11PM, and then still catch the Botafogo Social Club party which returns tonight in Lapa with a guest appearance by the legendary Keb Darge. For a complete list of all Rio Carnival 2016 blocos, see the wikirio page. Readers should know that while some blocos are family-friendly, the larger blocos may not be appropriate for children, and tennis (sneakers) footwear is advised, as is drinking lots of water and queuing up for the bathroom portable toilets early, as the fine this year for public urination is R$510. 30/jan (sábado) – 14 às 19 – De Ben Com O Rio – (Praça da Bandeira) – Atenção! O bloco cancelou sua participação nesta data. Mais informações no site! 30/jan (sábado) – 15 às 19 – Bloco Da Saara – (Centro) – Atenção! O bloco cancelou sua participação nesta data. Mais informações no site! 30/jan (sábado) – 17 às 21 – Vem Cá Me Dá – (Barra da Tijuca) – Atenção! O bloco cancelou sua participação nesta data. Mais informações no site!